This is one of the booklets that I have written. The games that are described are all from period sources which are included in the bibliography. The 19th century rules for the games have been reviewed and converted into directions I felt more appropriate for modern times. Where it seemed advisable, a change in materials used to play the game may be suggested, e.g., the use of rubber balls for one game instead of the fist-sized rocks described in the period source. One of the features we have found about these games is the dearth of equipment required for most of them. Usually a game can be played with materials at hand and willing players. Even for the ones requiring equipment, often it is a very simple item. Another interesting element of these games that modern children, with their frequently highly structured sports and games find different, is the simplicity of the rules and the lack of a "referee." If a dispute arise, they must learn to resolve the dispute on their own. 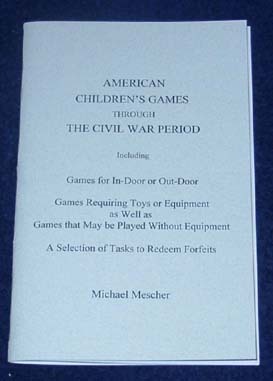 This booklet is also an excellent guide for someone wanting to conduct a session on children's games for a historic event. As a suggestion, the game "Puss in the Corner" is probably one of the simplest but most popular games. That game is suitable for all ages. This book is available wholesale for resale.